It’s 1948. My Grandpa Art Lamb marries Rita Hubbarth. His father, Jimmy Lamb, gives Rita a plastic pregnant doll. He tells his new daughter-in-law that the doll’s name is Gertrude. What it says on the base of the stand is “Kilroy was here,” a popular World War II reference. Get it? Kilroy, pregnant girl-doll? According to my grandmother,Rita, the doll is supposed to bring fertility to the newly married couple. Gertrude has been passed down through each generation since to married couples in the Lamb family. She’s had an almost-perfect success rate. It took a little bit of research through the census records (minus a Nova Scotia glitch) to find the answer. 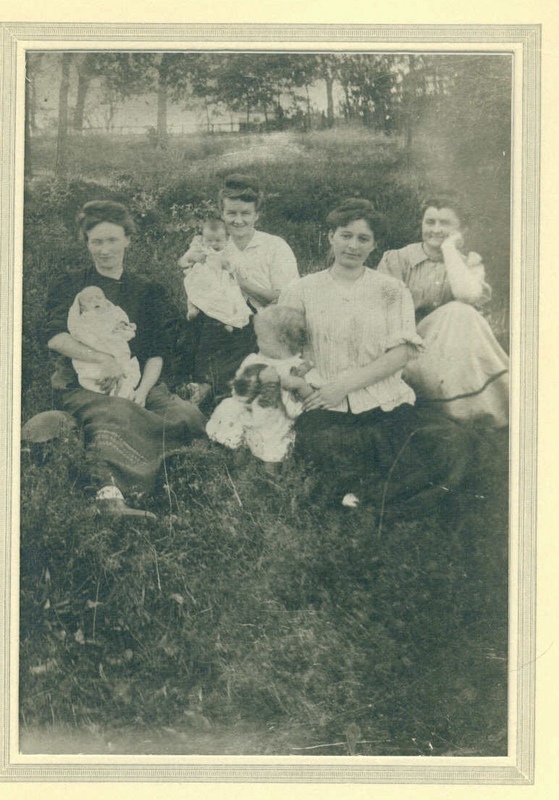 In 1905, Jimmy and Rose Lamb had their first daughter, Gertrude. By 1910, she was gone, one of the first of three Lamb/Heffernan children to pass away in this particular generation. Unfortunately, between 1910 and 1920, they lost their second daughter, Anastasia. In 1924, Rose was gone as well – taken by tuberculosis. I wonder why the doll is Gertrude’s namesake, as opposed to her mother Rose or her sister, Anastasia? Whatever the reason, giving the doll her name, opened the door to learning previously unknown history. My father remembers Jimmy Lamb as “grumpy,” (who could blame him?) but didn’t know why. Jimmy remarried, and his second wife, Mae, raised all of Rose’s children – the five who survived to adulthood. My grandfather referred to Mae as his mother, although he always kept the photo of Rose Glennon Lamb, who died when he was five. No one ever spoke of Gertrude or Anastasia. Yet forty years after the death of his first child, Great-Grandpa Jimmy Lamb remembered his daughter Gertrude. When families don’t tell their stories, the stories become lost. History is hidden. As sad as it is, there is something to be told, that can’t be forgotten. Historically, Rose and Jimmy worked at the Alexander Smith Carpet Mill in Yonkers and were directly impacted by the Industrial Revolution. Lives were lost due to tuberculosis. Out of this, is the story of a man who survived incredible loss to rise up and become a community leader and local politician…all stories that will be continued after Tanners and Quarrymen, as part of the Famine series. ← FamilySearch.org Beta: Use It! How many of these little dolls are in circulation? Are they of value? You can google "kilroy was here" dolls. I've seen some on Ebay, etc.